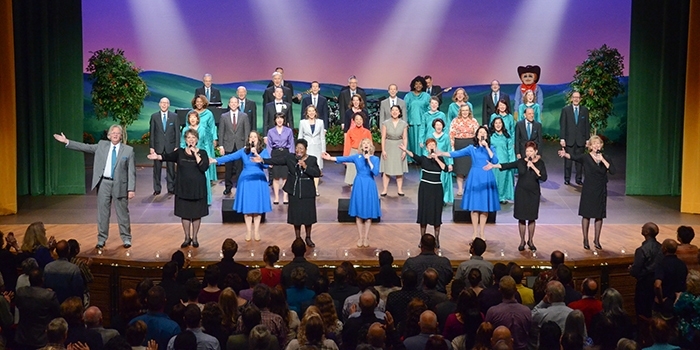 Way believers in the United States continue to reflect on the positive impact of the Way Productions 75th Anniversary Showcase DVD as they enjoy watching it in local gatherings. For many, the songs remind them of milestones in their own spiritual growth through the years, including when they first took a Bible class with The Way Ministry. The showcase was sensational! It brought back many joyful memories of my spiritual growth through the years. Amazing Way Productions! The songs brought us from the beginning of the ministry through to the present. Hearing certain songs reminded me of times when I was believing God to reach a particular goal, and playing ministry music helped me surround myself with the Word. When I heard those songs again, it made me so thankful for all God has done for me. Specific songs brought back the great deliverance God has given me, from the day I first took the class as a young college student to this very day. Yes, oh, the price He paid for me, and I am ever grateful. My heart is filled with thankfulness to our God and for our ministry. The first solo with the piano really hit my heart. It is called “Oh, the Price He Paid for Me.” It reminds me of before I got in the Word. It helps me remember how much I have to be thankful for today. As the evening progressed, I was all the more reminded of and endeared by the heart and passion of our music over the years. Just about every song and lyric was a documentation of our ministry’s heart and the vitality of the fullness of life God has given us. It showed God’s presence in my life and how God has encouraged, protected, lifted, and inspired me and others. What brought tears to my eyes was not the joy of singing along, or the nostalgia, but the song “I Took a Class.” Something stirred inside of me about what this ministry means to believers around the world—we all took a class. After watching this I was reminded that before coming to The Way Ministry, I always wanted to speak in tongues. I went to a few other organizations before going to my first ministry fellowship. I signed up for the class so I could learn to speak in tongues. When I spoke in tongues, I was so excited! We have all gone down memory lane today to see where we came from. Today we have the awesome privilege to show someone else the Word. The Word of God is the will of God…come and see! If you’d like to know more about Bible classes offered by The Way Ministry, read about The Way of Abundance and Power class series. If you’d like to have your own copy of music by Way Productions, visit our Bookstore. Then Contact Us to make plans to attend a Way Bible fellowship near you!